It seems to me that Japanese motor companies compete much like the American ones. Once one company has an idea, they all have to do it – only bigger, or smaller, or faster or … you get the idea. I think this is why they spent the last decade (what the Brits wittily call the “naughties”) developing city car concepts to out do each other. They might be an innovative glimpse of what we will be driving in the future, but right now they make me laugh. Don’t get me wrong, small compact cars with low mass are a great way to eek out the dwindling supplies of fossil fuels that remain. No matter how much there is left, it is a finite supply. 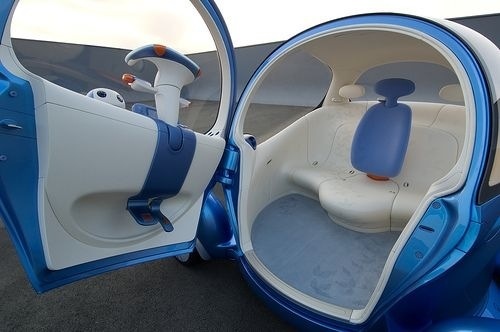 And while the freeways are crammed with 9000lb pickup trucks (generally with one person on board) who is going to want to sit in these sort of creations? The draft from a passing F-150 of Dodge would likely tip this thing over. So what’s this lunar rover meets melted plastic thing got going for it, concept wise? For starters, the car is electric, each wheel having its own motor. This makes steering the wheels much easier, so they can all be rotated to 180 degrees, meaning the Pivo car move in any direction it likes. Here’s an example of doing it’s party piece – parking sideways. 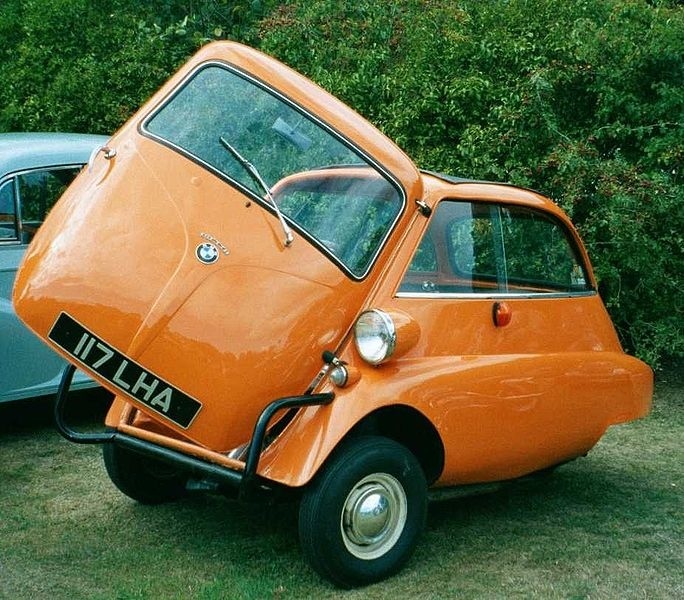 It’s one step up on the BMW Isseta, which you could drive into your garage, right up to the far wall, only to find you couldn’t open the forward hinged door, and couldn’t reverse because the car wasn’t equipped with reverse gear. In an effort to simplify the look of the exterior, the headlights are hidden behind the car’s plastic skin. They kind of glow through it. Great for people to see you, probably not so great for the whole headlights-illuminating-the-road-ahead thing which headlights are famous for. I am all for simplification though, I mean why do we build cars, planes, houses and everything else from so many disparate parts? The inside is just as whacky as the outside. The driver has the center seat with two passengers on the sides. Again the car is formed with a minimum piece part mentality. Unless they have conquered the art of blending soft and hard plastics in one forming, those seats are going to be rock hard to sit on. Probably not a big issue since the Pivo is battery powered, so won’t make it much further that the shops and back anyway. Visibility is great. The windows, er plastics, surround you and the pillars are thin. Smashing. Even I, with my beer bottle glasses, should be able to see out. 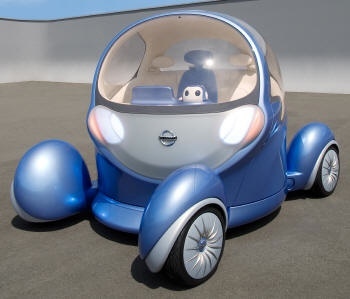 But Nissan wanted to up the safety factor (not a bad idea since there’s only a sheet of floppy plastic between your squishy parts and that passing 18-wheeler). So they fitted their “Around View Monitor” system to watch the blind spots. Blind spots? There’s more glass in this thing than a Hogwarts greenhouse. Maybe they plan to make it able to take off vertically and the blind spot monitor would inform you of Harrier jump jets hovering overhead? “No, no no …” (to the sound of tires squealing). Yep, Pivo drivers will be stacked up like cordwood at emergency rooms around the countries while their electromechanical pals call everyone in their address book informing them of their friend’s life threatening condition (in a chirpy voice, of course). What of the gestures? Well, I’m glad you asked, because I’m out of ideas … but I’m sure you have a few! And why do we build things from so many parts? Perhaps Nissan will provide a bag to put over the guy’s head to allow you some personal space for your personal habits! In fact I suspect a whole industry could spring into life, just like iPhone cases. Hysterical, Nigel. And I thought the old ‘Your door is ajar’ was annoying. I’ve had similar experiences with Silicone Sally answering machines. Speaking of answering machines, Robin Williams has a great routine, but too many ‘bleeps’ to risk posting even the smallest excerpt here. Gloria, plucking nose hairs? Never driving with you again. Numero dos. If I did, which I am NOT saying I do, my hand knows where my nose is positioned. Any hairs encountered by tweezers would NOT require visual inspection. Really, don’t worry. I don’t care what the others say about you, I think you’re all right! I think I’ve heard that answer phone gag with Robbin Williams and I’m trying to steer clear of needing a rating. So your car has a voice. Mine just bleeps at me – I’m not sure which is more frustrating. 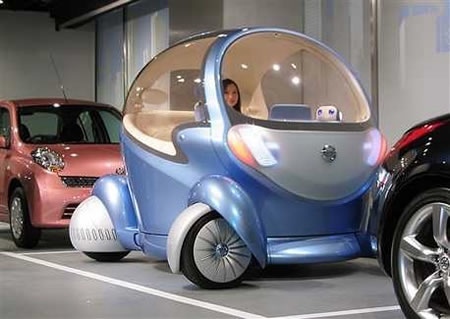 I’m surprised that this car is not on the streets of Tokyo already. I hhave never driven there and don’t care to try it. I had never seen that BMW Isseta before. It looks like it rates it’s own article. Future teenagers might never have the experience of automotive romance. Perhaps I should buy a few old 70’s Cadillac monsters, tint the windows, park them in handy locations where teens hang out and then rent them out by the hour to this upcoming generation of teens. Never seen the BMW? Well, I can’t miss that challenge. There are a host of wired looking things on the streets of Tokyo, but this isn’t one of them. Your right though, it’s going to happen. In many way in a cramped urban environment it could work, but in the rest of the world it’s useless. I have to admire your entrepreneurial spirit. There’s plenty of 70s vehicles around. Heck you could even set up a drive in movie where everyone arrives by train and selects their car for the movie. I am disappointed thought – no one has suggested a single gesture to interact with the electronic pal. There again, maybe I can eek out another post, with a suitable x rating of course. 1970s Cadillacs? Give ’em the real thing – 1958 Cadillacs – most beautiful cars ever built. I was thinking of making some cheap remark about not being old enough to remember that far back, but I won’t. I’m old, but I’m not cheap! Hi David. I like your idea but I am on a budget. A couple of banks have already turned down the chance to get in at the ground level. I guess I’ll have to apply for a government grant as a pilot project to reduce teen depression. My 8th grade American history teacher actually drove and Isseta. He had a family to support on a teacher’s salary and lived far enough away from the school it made a difference, even with our 25 cent gasoline. Rumor was that some guys picked it up and set it in the main hall of the school, but I don’t know if that happened or not. I once went to London in a (old style) Fiat 500. When we went home the cars from and rear had blocked us in. So, we picked the car up and walked it sideways into the road. I wouldn’t like to try that with the new version. After Holmes’s comment, I’m going to give the Isseta a post in a week or two. Hi Diane. Thanks for the laugh. I get the tinsey-weensey idea that you might enjoy the odd traffic light brawl, but that can’t be right, can it? No, no, no, what was I thinking. Of course, it’s much easier if you ride a Harley – you can just reach over and swing away without getting off your ride. So I’m told, anyway. I shall take more care to watch out for battered half-ton trucks in the future, especially now I know they don’t have a shotgun under the seat. Might those cute little eyes also recognize distracted driving and force the car to pull over? Hmm… 😉 Another great post, Nigel. Cheers! I expect they have lans along that line. There are systems to detect drowsiness already. Don’t know how well they work. In this case though, the sheer frustration of a computer program always trying to be my friend would be enough to distract me from anything going on outside.